An Asteroid storm is coming. Rick Munday, a struggling astrophysicist from Cal Tech is invited to a seminar. He is kidnapped and taken to the Utopian city of New Arcadia where he learns that the asteroid storm has already begun. Rick escapes New Arcadia in hopes of saving his family only to end up in the middle of Nebraska. Rick and new friends he meets along the way attempt to thwart the efforts of the Arcadians and save thousands more souls, all while dodging meteors and being chased by the evil Captain Kobalt. Start reading today and join Rick on the adventure of his life. Mike McCoy is an international businessman and entrepreneur who has traveled extensively and worked in consumer electronics industry for more than twenty-five years. During his time in the tech industry the company he founded, developed a variety of cutting-edge products which were sold in retail stores around the world. Mike is also an accomplished athlete known for long distance events. He completed a full Ironman Triathlon in 2006. When he turned fifty, he ran a double Marathon (52.4 miles). He thought running fifty miles when turning fifty would be a good accomplishment. In 2018, Mike celebrated his sixtieth birthday with a six-hundred-mile bike ride over six days from Florence, Oregon to San Francisco, California. Somehow, he found time to write. 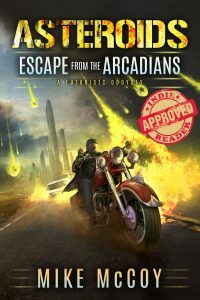 Asteroids – Escape from the Arcadians is his first novel.